La copertina dell'album, ispirata a questa canzone, è di Gertrude Degenhardt, moglie di Franz-Josef Degenhardt. The album cover, inspired by this song, is by Gertrude Degenhardt, Franz-Josef Degenhardt's wife. Aleksander Kulisiewicz (1918-1982) was a law student in German-occupied Poland when, in October 1939, he was denounced for anti-fascist writings, arrested by the Gestapo, and sent to the Sachsenhausen concentration camp, near Berlin. 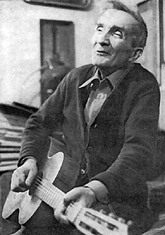 An amateur singer and songwriter, Kulisiewicz composed 54 songs during nearly six years of imprisonment at Sachsenhausen. After liberation he remembered his songs, as well as those learned from fellow prisoners, dictating hundreds of pages of text to his attending nurse at a Polish infirmary. Zofia Karpińska, a beloved camp poet, wrote the words to this love song in 1943 in the extermination camp, Majdanek (near Lublin, in Eastern Poland).